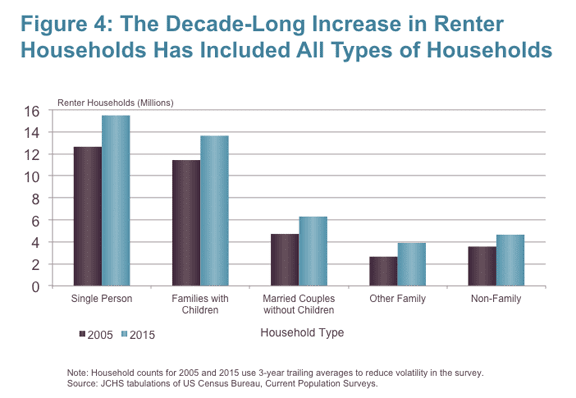 One of the major trends highlighted in the Joint Center’s recently released report America’s Rental Housing 2015 is the unprecedented growth in the number of renter households over the past 10 years. 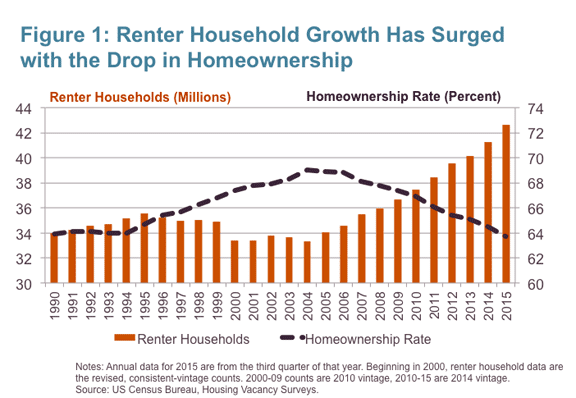 The numbers are dramatic no matter how you slice them, leading to an impressive list of facts: we’ve been adding nearly a million renter households a year for almost a decade; the number of renters has grown by fully 25 percent in the past 10 years; there are nearly 9 million more renter households in 2015 than there were in 2005; and in the past ten years we have seen the largest increase in renters of any 10-year period in history on records dating back to the 1960s. This sharp growth in demand has been the primary force behind the widespread tightness in rental markets that has driven vacancies down and rents up for millions of Americans as supply works to respond. And supply is responding with more multifamily construction currently under way than in any time in the past 30 years. 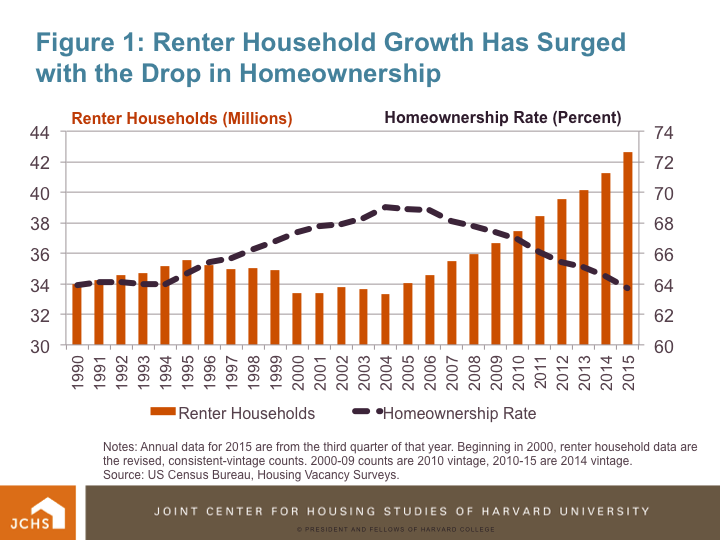 So who are all the renters behind this recent growth? The answer may be somewhat surprising, particularly in terms of the age breakdown. One might imagine that since renters tend to be younger (with a median age of 40 years versus 55 for homeowners), the majority of recent growth would have been from millions of young millennials piling into rentals in high numbers. It turns out, however that while the millennial generation (born 1985-2004) is indeed the largest in history in terms of population, they are only responsible for a relatively small portion of the growth in rental population over the last 10 years, approximately 11 percent. In contrast, well over half of the growth in renters (55 percent) – fully 4 million households– was from people aged 50 and over. Generation-X-ers (born 1965-1984) in the 30-49 year old age group were responsible for 34 percent of all renter household growth since 2005. As shown by figure 2, much of the growth in the number of renters age 50 and over reflects a boost in population due to the baby boom generation, who are currently age 50-69 and now entirely in this 50+ age group. 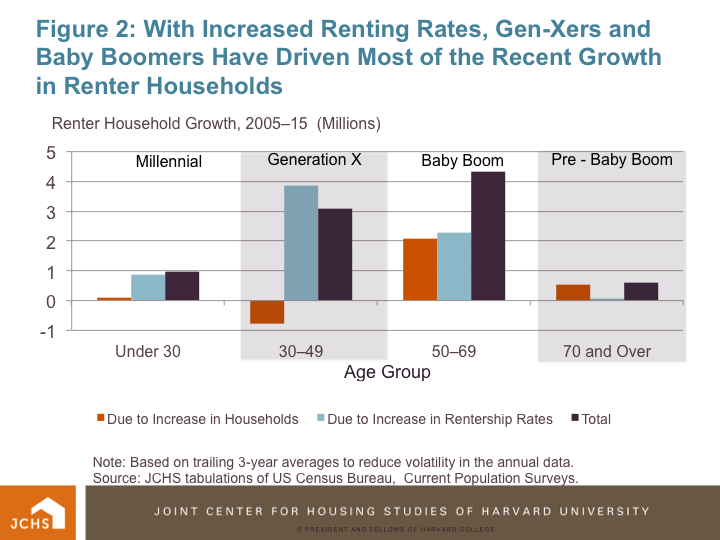 However, only about half of the growth in renters over age 50 resulted from population growth. The other half of growth was due to householders being more likely to rent than in past years. 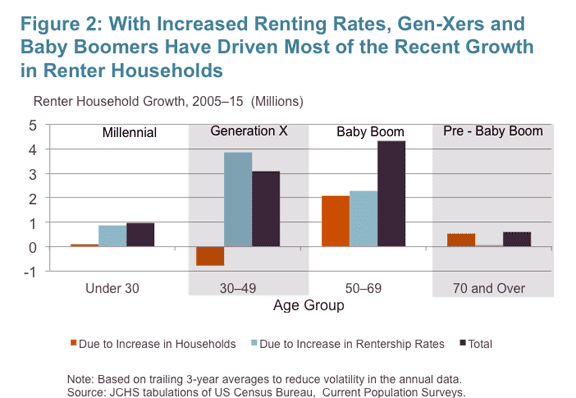 Figure 2 also shows how the increased rate of renting among gen-Xers was the entire source of growth in the number of renters aged 30-49 year old. That the number of renters in this age group grew at all over the past 10 years was impressive given that the total number of households in that age group (owners and renters combined) actually declined during this period. Indeed, at a stage of life where first time homebuying typically occurs, rentership rates for this generation have not fallen off with age like those of previous generations. Renters are sitting tight, moving less, and making fewer units available for Millenials to enter the rental market. In addition to the age breakdown, the incomes of new renter households may also be surprising. 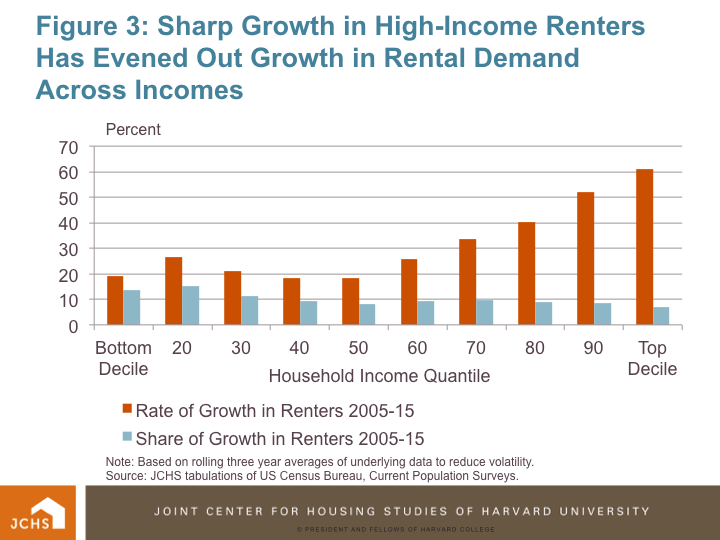 Again, while renters as a group still tend to have lower incomes relative to owners (median income of $34,000 versus $65,000 for owners), the fastest rates of growth over the past ten years has been in high-income renters (Figure 3). The number of renters in the top 10 percent highest income bracket grew by 61 percent, more than double the pace of overall growth in renters. 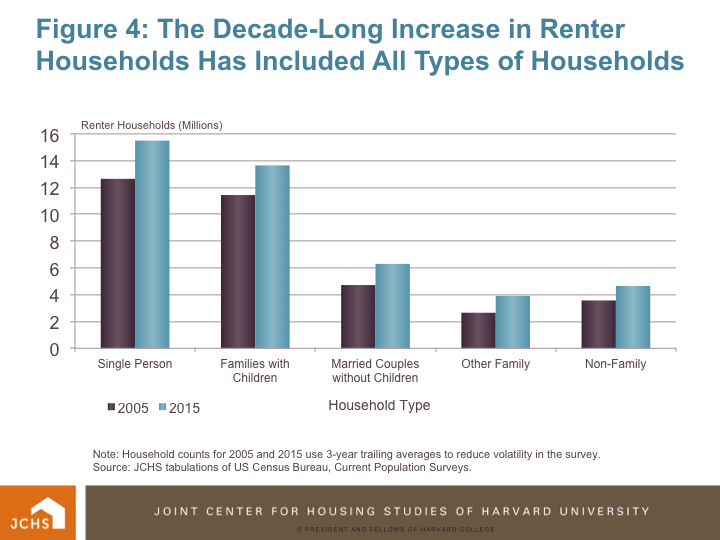 Growth in renter households has extended beyond single-person and unrelated roommate households to encompass all types of living arrangements, including those more commonly associated with homeownership (Figure 4). Families with children made up a quarter of all growth in renters in 2005-2015, roughly evenly split between couples and single parents. 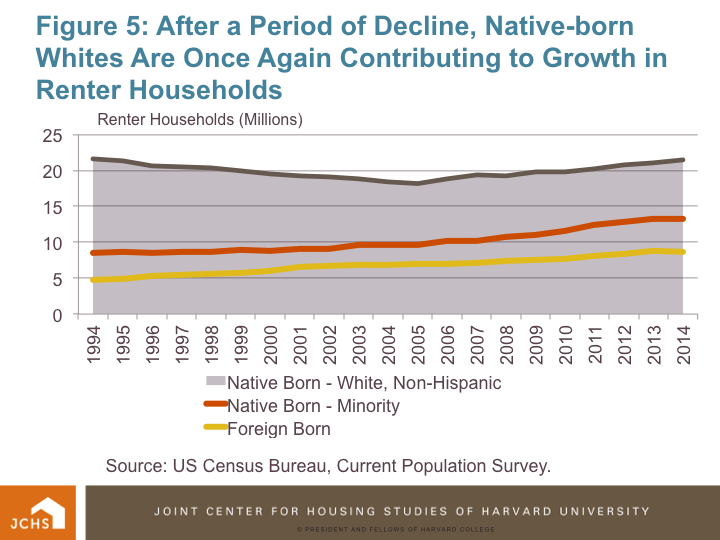 Additionally, with the resurgence in the number of white, non-Hispanic renter households (who made up one-third of renter household growth in 2005-2015), renter growth was split more evenly across races and ethnicities than in the 1990s and early 2000s when the number of white renters was on the decline. 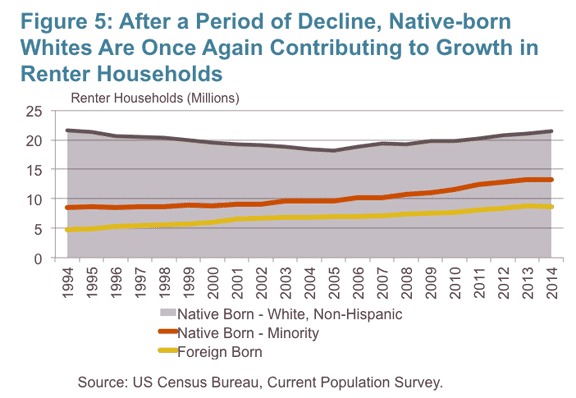 But minority households continued to be a large part of renter growth, as have immigrant households, with foreign-born renters making up fully 26 percent of growth, even with the post-recession slowdown in immigration. 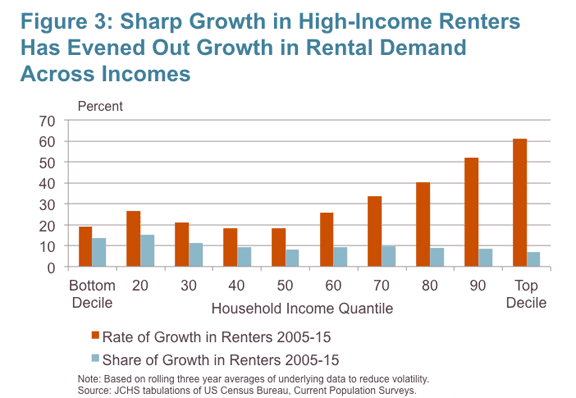 In sum, the wide-ranging surge in rental demand underscores the fact that rental housing remains an important and necessary housing option for people of all races, incomes, and living arrangements, and one that is becoming an increasingly popular housing choice at all stages of life. The diversity of the population demanding rentals also necessitates a broad range of rental housing options—with an array of types, styles, sizes, amenities, rent levels, and locations—to meet the needs of renters today and in the future.